1 Place beans in a sieve, rinse well with cold water and drain. 2 Peel and dice onions. Heat oil in a pan over medium heat. Cook onions about 1 minute. 3 Juice orange. Add maple syrup, orange juice, chile pepper and ketchup to the pan. Bring to a boil. 4 Stir in mustard powder. 5 Add beans and stir to combine. 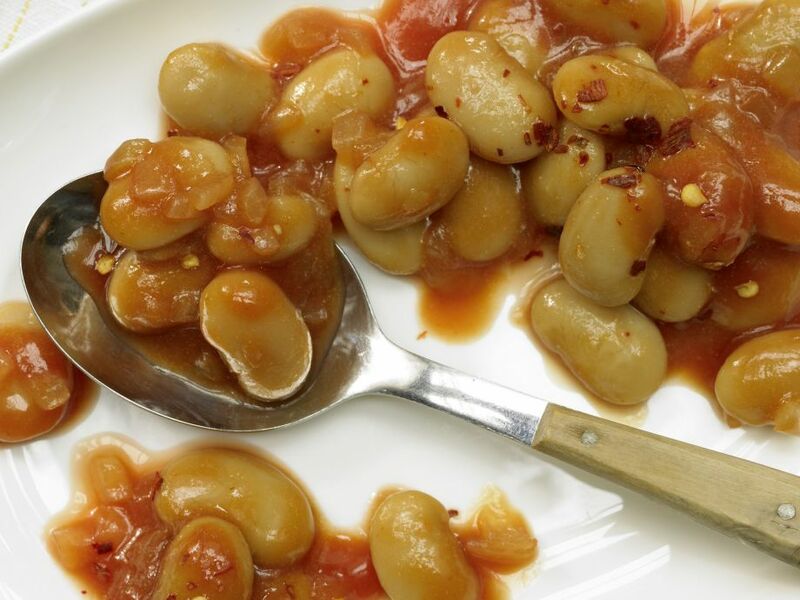 6 Pour beans and their cooking liquid into an oven-proof dish or pot with a fitted lid. Cover and bake in a preheated oven at 150°C (fan 130°C, gas mark 1-2)(approximately 300°F/convection 265°F for about 1 hour.